"Rest in Peace Dear Aunt Kitty - Love, Gail"
"You were a great French, Latin and Civics teacher, Mrs...."
MADISON - Kathleen A. (Brousseau) Martin, 89, passed away Jan. 3, 2019 at Woodlawn Nursing Home in Skowhegan. She was born Aug. 12, 1929 in Sturbridge, Mass., the daughter of Emile J and Sarah (Doyle) Brousseau. 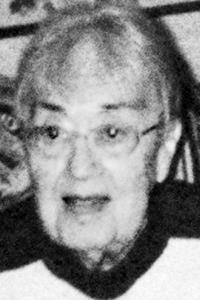 She graduated from Boston University in 1951 with a bachelor's degree in Literature. On June 6, 1950, she married Thomas Martin in Boston. Kathleen was a teacher of Romance Languages at the following institutions: Lawrence High School in Fairfield from 1963 to 1966, Oak Grove School in Vassalboro from 1966 to 1968, and Carrabec High school in North Anson from 1969 to 1974. During the 1970s and 1980s, she was an active member of the Skowhegan Community Action group (SCAG) and later, the Madison Historical Society. She was the editor and coordinator of the updated history of Skowhegan, entitled Voice on the Kennebec 1941 to 1981, printed by the Skowhegan press in 1983, under the auspices of SCAG. Later, she was to work and self-publish Our Irish Kin 1805 to 1993. Her greatest literary accomplishment came with the publication in 1988 of the genealogy of the descendants of George and Susannah Martin entitled The Martins of Mooretown. There were numerous printings, the final one occurring in 2000. Kathleen is survived by her husband of 68 years, Thomas B. Martin of Madison; son, Julian B. Martin of Canaan, daughter, Michele L. York of Kearny, N.J.; grandson, Sheyenne York of Michigan; niece, Gail Langlois and husband, William of Oldsmar, Fla.
She was predeceased by her parents, Emile and Sarah (Doyle) Brousseau; sister, Pauline Miller and husband, Ralph. A memorial service will be held in the spring 2019 at the Maine Veteran's Memorial Cemetery in Augusta at the convenience of the family. Arrangements under the direction and care of Dan and Scott's Cremation and Funeral Service, 445 Waterville Rd., Skowhegan, ME 04976.